Our activities and solutions based on the AI are the answer to the growth needs of your business and to the objective of making it customer-centric. The starting point is always customers and users’ data. Often the unique value proposition comes from the combination and the activation in our data lake of proprietary data of the companies, traditional third-party data and Alternative Data. Our solutions are easy to implement and simple to use, avoiding the need for complex integrations and dependency on IT teams. 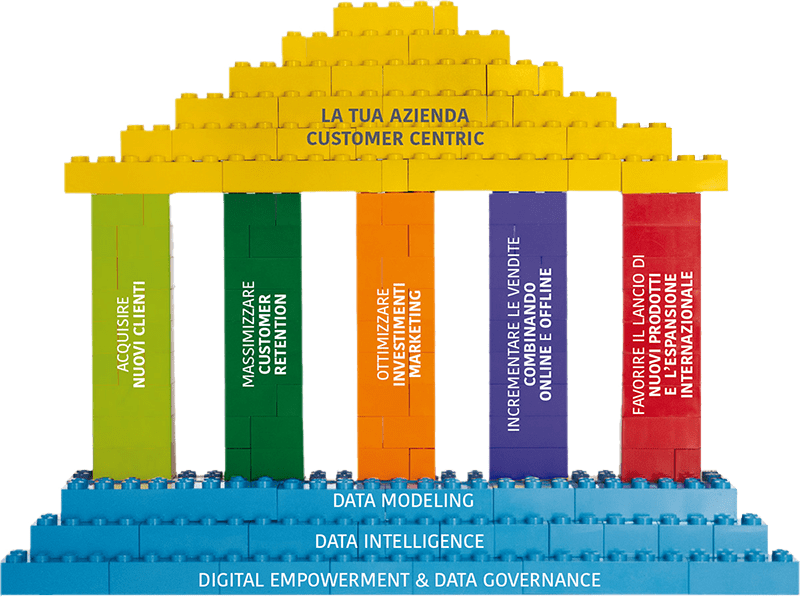 Design strategies of digital data collection, distribution and usage, connect the online and the offline, improve digital skills in the firm. Proprietary solutions of immediate, actionable extraction of insights to improve decisions and results. Tailored creation of new data models to open new business frontiers and to obtain the competitive advantage. WE MAKE DIFFICULT THINGS EASY BY WORKING WITH DATA. Acquire new clients, retain existing clients, optimise marketing investments, increase sales by connecting the offline and online, favour new product market launch – those are the everyday challenges of your business that we want to share by using a modern, data-driven approach and the most advanced AI technologies. We will help you to adopt a data-driven approach to your business. Volume, velocity and the variety of the external data produced on the internet is impressive. It though is still possible to extract information from this data that is largely unstructured and spread across different platforms. We enable those who work in financial advisory and investor relations for listed companies to easily access the so-called Alternative Data by analysing the information collected in digital environments and creating digital indicators to compare with financial data.